The infamous and ever eluding TR-7 "pin diode" problem is probably the single most difficult repair to make in the radio. Troubleshooting and finding the pin diodes is the easy part, getting at then to replace is a definite challenge. The pin diodes are found on the High-Pass Filter assembly, just behind the S-meter and in the same compartment with the internal speaker. The pin diodes are used for low level signal switching for the 25Khz Calibrator on the front board of the filter assembly, and on the rear board, low level signal switching to and from the Up-Converter. The front board is the board closest to the front of the radio directly behind the S-Meter. The rear board is located on the other end of the filter assembly. 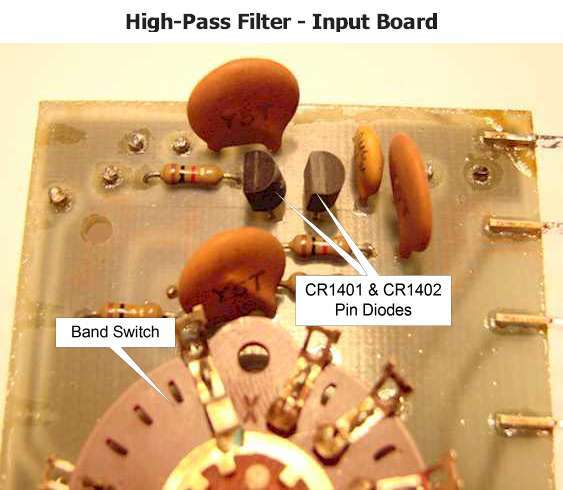 The High-Pass Filter, front board, switches the Calibrator signal to the Up-Converter through CR1401 and CR1402, (MPN3404 Diodes). Referring to the front board diagram to the right, you see there are three input signals going to the input switch side of the filter. The VLF Antenna input, (Red Arrow Line), transmit & receive signals to the Up-Converter (Green Arrow Line), and the Calibrator signal, (Blue Solid Arrow Line). When the front panel Calibrator switch is selected, that sends +10VDC through resistor R1401, (Blue Dash Arrow Line), which forward biases the two pin diodes creating a low resistive signal path for the calibrator signal to flow to the Up-Converter input. When the Calibrator switch is de-selected this removes the voltage, reverse biasing the pin diodes, which stops the Calibrator signal from going through the pin diodes. Accessing these pin diodes and soldering is very difficult and requires a certain amount of skill and patience getting them replaced. The best method I can recommend is to follow the disassembly procedure detailed in the TR-7 Service manual. The picture below shows the location of the two pin diodes on the High Pass Filter - Front Board. The High-Pass Filter - Rear Board switches the low level signal to the Up-Converter from the antenna connector in the receive mode and the signal from the Up-Converter to the Power Amplifier module in the transmit mode. On this board the pin diodes are a high frequency switching diode, number UM9401. The 13.6VDC switch control voltage to turn on and off the pin diodes comes from the a set of relay contacts in the antenna relay. In receive mode a 13.6VDC control voltage is applied through RFC1504, (Green Dash Arrow Line) which forward biases pin diodes CR1502 and CR1503, allowing the input signal from the antenna connector to pass though to the input selector switch, (Green Solid Arrow Line), and the filter assembly. In the transmit mode a +13.6VDC control voltage is applied to RFC1501, (Red Dash Arrow Line), forward biasing pin diode CR1501, allowing the low level transmit signal to flow to the Power Amplifier, (Red Solid Arrow Line). Some of the more common problems with the pin diodes on this board is when they short or start leaking. When this occurs low power output and low receiver sensitivity will both be noticeable and having a greater affect as you go higher in frequency. Troubleshooting a pin diode problem will be a bit tricky from the standpoint of getting to them to take measurements. On the Front Board, when the Calibrator switch is selected that puts a positive voltage on the anodes of both CR1401 and CR1402. As you go from the anode to the cathode you will see a small reduction in voltage, typically a .6 to 1 volt drop across each diode. If a total loss of voltage is found across one or both pin diodes, that diode is probably open, and with measurable voltage but no voltage difference across them, the pin diode is shorted. In either case the defective diode is preventing the signal from reaching in band switch input. When the Calibrator switch is deselected all voltage should be removed. One common problem caused by one or both of these diodes going bad or leaking is poor receiver sensitivity and low power output on 10 meters. 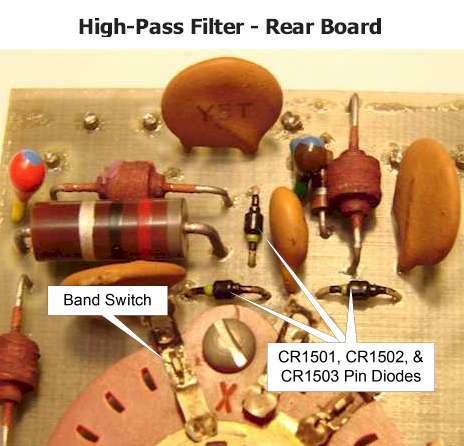 Typically CR1402 shorts and causes the input signal to be grounded through capacitor C1404. This effect is most noticeable on 10 meters. Troubleshooting the Rear Board will be more difficult since there is a switched voltage to deal with on transmit and receive. In either mode there will be a measurable voltage at the input of the band switch, but with the voltage source coming in from two different directions. The best way to check these pin diodes is to lift the cathode of the pin diode opposite to the mode being tested at the input to the band switch. This way the receiver pin diodes will not induce any effect on the transmitter side being tested, and vise-versa. In either the transmit or receive mode you should be able to follow the voltage from anode to cathode to the band switch. If the positive voltage is not measurable at the cathode, the diode is defective. Before replacing the pin diode cathode you previously lifted from the board, measure the receiver sensitivity or power output. After replacing the the pin diode cathode you should still see approximately the same results. If the result is noticeably different one of the pin diodes on the opposite side is probably leaking pulling down the input signal. Following this procedure on both the receive and transmit modes will detect open and leaking pin diodes.